posted by Harry on 2012.10.18, under Frugal Fashion! As I’ve been scanning the street style blogs I’ve been noticing an interesting trend outside of the tents. Whether it be New York and London or Milan and Paris, everyone who’s anyone is wearing the statement tee. Pioneered by fashion editors and fashion bloggers alike this trend is a no fuss easy way of looking high fashion without making your wallet cry. While most of us aren’t able to afford the Givenchy “Rottweiler” tee or the Balenciaga “Skyline Vegas” tee ($300 for a t-shirt?! I don’t think so..), we at the Frugal Materialist have some affordable options. 1. 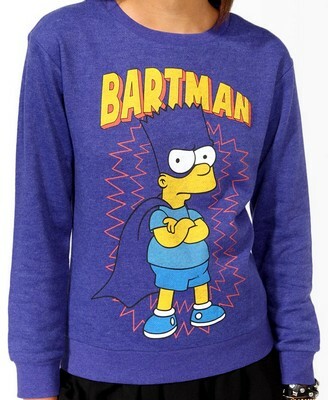 Bartman Pullover 19.80 (Forever 21): This french terry pullover is the leading contender against the Jeremy Scott BARTMAN Sweater, pair this with a distressed leather jacket, dark washed jeans and ankle boots for a more mature look and you’ll be doing the Bartman in no time! 2. Zara Graphic Print T-shirt 19.90 (ZARA): I noticed that many stores are doing the “rabid dog” or hungry panther print (their take on the Givenchy “Rottweiler” tee) so if you’re more of an individual who likes to stay on trend this tee is for you. I like this ZARA tee because I love the subdued jungle cat print, cuff the sleeves and wear with a waxed denim or leather pant for a more Parisian feel. 3. 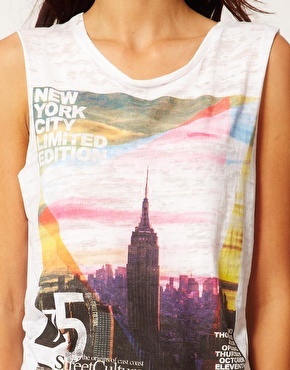 River Island New York T-shirt 26.39 (ASOS): This tee reminds me very much of the Balenciaga “Skyline Vegas” tee, with its faded neons and bold type. I love the burnout effect and of course the price! I’d say its a awesome alternative; wear with sweatpants and a suede heel for a classic rocker effect.